As you can see, there are some amenities that are more easily achievable than others, in terms of costs and practicality. 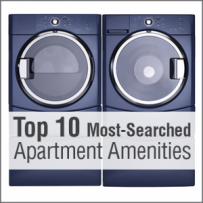 If some amenities are out of reach for your community, consider offering alternatives to prospective residents – for example, if your community does not have washers/dryers in unit, you could work with a local Laundromat to provide discounts to your residents. After all, if your community is only missing one amenity from their list of must-haves, your efforts just might sweeten the deal and encourage them to sign a lease with you!